There are a lot of methods that daily fantasy experts advocate for picking pitchers on FanDuel and DraftKings for daily fantasy baseball. One is looking at the spread. A pitcher whose opponent has a low run projection should be a solid play. Another is looking at the opposing teams strikeout rate for the year, or even their strikeout rate against left handed pitchers versus right handed pitchers. There are many issues with these methods. For one, a bad hitting team can be a low strikeout team (the Royals for example), and earned runs are not that problematic, especially on FanDuel where they are only negative one point. Strikeouts are easily the most valuable stat for a pitcher, so low strikeout teams, no matter how bad the hitters are, tend to be bad matchups. The issue with evaluating matchup based on team strikeout rates is that lineups constantly change. Good hitters get injured, return from injury, or get a day of rest while bad, high strikeout hitters can sometimes find their way into the lineup. For example, the Nationals are normally a good hitting team with low strikeout rates, but with 4 of their 5 best players are injured at the time I’m writing this article, so the historical data is worthless. I’ve preached in previous articles that you should look at each individual hitter in a lineup to evaluate a matchup for an opposing pitcher. Today, I’m introducing a tool I call Pitcher Matchup Score, which will help you determine how good or bad a matchup individual hitters are for opposing pitchers. This is ONLY available to our premium members, so sign up for our free 7 day trial to check it out! MatchupScore is calculated using a variety of factors. One is historical strikeout rate. Hitters who strikeout a lot increase the amount of strikeouts we expect the opposing pitcher to record. Since strikeouts are one of the most valuable statistics in daily fantasy for pitchers, strikeout rate is heavily considered in MatchupScore. Another factor considered is pitches per plate appearance. The best outcome for a pitcher, besides a strikeout, is getting an out while only throwing a few pitches, because it keeps their pitch count low and lets them go deeper into games. Jose Altuve has a strikeout rate under 10%, but because he only sees 3.15 pitches per plate appearance, the lowest on the list, he isn’t too bad of a matchup for an opposing pitcher. Danny Espinosa has a 26% strikeout rate, lower than everyone 15 spots or less below him in MatchupScore, but his 3.62 pitches per plate appearance is extremely low for someone at his strikeout rate, and gives him a better hitter score than many other players with higher strikeout rates. MatchupScore becomes incredibly useful later in the MLB season as team makeup changes. For most of the season, the Nationals have been a good hitting team with an average strikeout lineup. But as mentioned earier, 4 of their 5 best hitters, Denard Span, Anthony Rendon, Jayson Werth, and Ryan Zimmerman are all injured. Replacing them are Michael Taylor (10th in MatchupScore), Tyler Moore (34th), and Dan Uggla (41st). Suddenly, with Danny Espinosa (22nd) and Ian Desmond (46th) already part of the regular lineup, the Nationals go from an average matchup to one of the best matchups for fantasy pitchers in the league. Some teams have exceptionally poor benches, which can make them go from decent to great matchups depending on who is getting rest in the lineup. The Marlins are a great matchup for opposing pitchers, but when Jeff Mathis (12th in MatchupScore) is in the lineup for J.T. Realmuto (459th), they become even better. When David Ross (13th) replaces Miguel Montero (257th) for the Cubs when Jon Lester (strikeout rate over 50% of the time as a hitter) is pitching, the Cubs go from a great matchup to a crazy great one. One thing that hitter score is missing is considering the skill of the hitter. Joey Gallo tops the MatchupScore list, but he is an extremely good hitter, and therefore probably not as good as a matchup as Carlos Peguero, who is a below average hitter. To measure a hitters skill, I recommend going to Fangraphs and using wOBA. Using Vegas Odds is also a good proxy. Teams projected to score a low amount of runs are going to be the teams with the worst hitters. Another factor missing is handedness splits. Some hitters strikeout drastically more or less against left handed or right handed pitchers. I’m planning on adding this feature in the future, so stay tuned. Basic methods such as using Vegas Odds and team strikeout rates have a lot of flaws and tend not to be accurate measures of quality of matchup. Team makeups can drastically change during the season, which can make historical data worthless. The best approach to evaluating matchup is to look at each hitter individually. 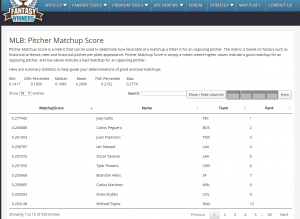 MatchupScore considers both strikeout rate and pitches per plate appearance to determine the matchup quality of a hitter in terms of opposing pitcher fantasy stats. MatchupScore does not consider skill of the hitter, so use Vegas Odds and wOBA in conjunction with the metric.